Kenny Jackett believes Pompey’s returning new boys can rejuvenate his side’s League One promotion push. The boss feels the likes of Andy Cannon and Lloyd Isgrove will help get the Blues’ Championship charge back on track once fully fit. 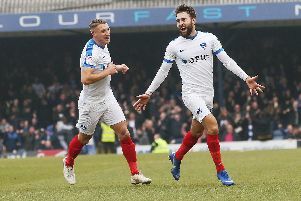 After sitting at the top of the table for almost four months, Pompey’s recent dip in from has seen them fall out of the automatic promotion places. The 1-1 draw at Plymouth extended the Blues’ winless streak to five league games and widened the gap further between themselves as the top two. Jackett brought in six new arrivals during the January transfer window. However, only Omar Bogle and Bryn Morris featured against the Pilgrims at the weekend. James Vaughan and Viv Solomon-Otabor were unused substitutes, while Cannon (quad) and Isgrove (knee) were injured. With a period of five games in 15 days approaching, Jackett knows having all his weaponry available will be crucial. He reckons being able to maximise his options could be the key to Pompey returning to the automatic promotion spots. The Blues manager said: ‘We’re not happy with it (slipping out of the top two). ‘We’ve had two draws against Doncaster at home and Plymouth away. ‘They were cracking matches but, ultimately, we want to be winning games. ‘We’ve had two 1-1 draws in the past two games. That’s not exactly what we want. ‘If you’re looking at an overall period, you want to be and need to be winning games to keep pace with whoever is going to be at the top of the league and to get the kind of points total you can get into the Championship with. ‘We have set some good standards in terms of play. ‘Once we can get the new lads up to speed and make sure they’re ready to play – like Bogle is and Morris was on Saturday – then things should be different. ‘There’s been niggling injuries to one or two of those guys. ‘They’ll give us good options to make sure as we go into a key period of the season with five games in 15 days. Jackett only used one substitute at Plymouth, with Oli Hawkins replacing the injured Bogle. However, sections of the Fratton faithful questioned why deadline-day signings Vaughan or Solomon-Otabor weren’t introduced for the likes of Ronan Curtis and Jamal Lowe. The Pompey boss admitted he felt the wingers were still a goal threat in the closing stages. Jackett added: ‘We’ve got good options. ‘I did feel even late in the game Lowe or Curtis could still win us it.